In 1355 the first urban space of medieval Barcelona was opened: La Plaça Nova. Throughout the centuries the square held markets dealing with slaves, straw, old furniture, ... and was a place to hire porters. On occasion with the sixteenth century plague, the neighborhood of the Plaça Nova takes Sant Roc as its patron. Since 1589, on the day of the saint (August 16), a series of events were held by the porters guild located on the square. The brotherhood of Sant Roc continued the tradition. And since 1794, the feast of Sant Roc de la plaça Nova is organized by neighbors assembled as Feast Committee. The Feast of Sant Roc de la plaça Nova, is the oldest, and still active, popular feast in Barcelona, ​​with many singular events: The "Cucanya", the "Porró-llarg", the "panellets", the Balloon of Captain Munyon, the Entourage of Sant Roc... and the giants. In 1905 the construction of a pair of giants and two "big heads"- Tano and Beco- were commisioned to the image workshop Christian Art of Olot. It is clear that the design of the heads followed the model set in Olot, by the sculptor Miquel Blay. The giant was 2'75 meters tall and the giantess was 2'70 meters tall. The sculpture was (and is) made with cardboard and cardboard pulp (plaster and glue) and is attributed to the master sculptor Toribi Sala i Vidal. In 1906 they are presented for the Feast of Sant Roc. For years they danced to the sound of the flabiol flute player of Sant Llorenç d’Hortons known as "en Mataporcs." The giants still had no name and were simply referred to as the giants of the Plaça Nova. The next year they added a third dwarf -Cu-cut-. 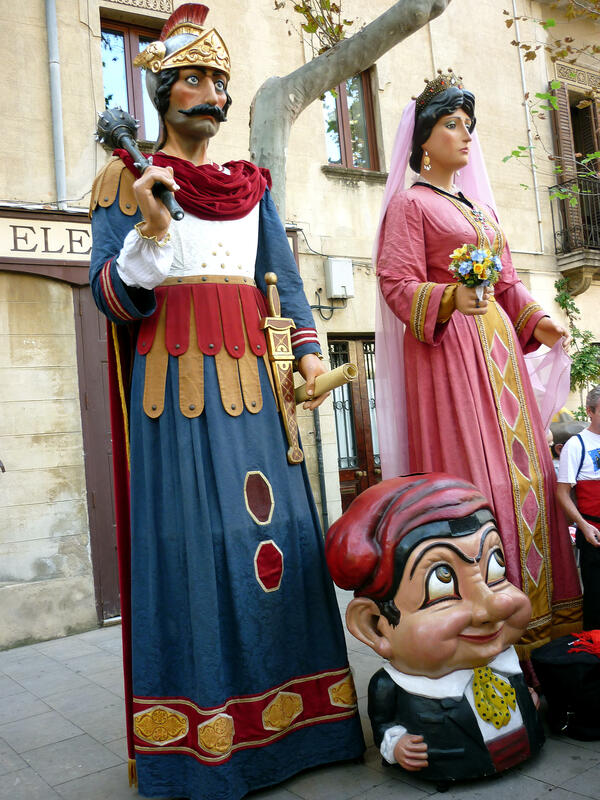 The giants of Sant Roc de la Plaça Nova are the first giants in Barcelona belonging to a neighborhood association. Their activity was uninterrupted until the Spanish Civil War. In 1939 they came out of their hiding place (one of the roman towers of the square), where they were miraculously saved from the bombing that devastated the neighborhood, and they restarted their activities for the Feast of Sant Roc of that year. Being for some years the only active giants in Barcelona. Since 1952 they have participated in the celebrations of la Mercè, dancing to the sound of the fabiol flute player Ramon Paulís of Sant Feliu de Pallerols. In 1955, on the occasion of the celebration of the six hundred years of the Plaça Nova, new dresses were made for them with a design of the painter and resident Antoni de Pàdua Rigau, and their easels were made to grow more than a foot. In the late sixties they changed dress again (theatrical tailoring Llorens) and did some performances outside Barcelona. In the celebration acts of the seventy-fifth anniversary of the Reial Club Esportiu Espanyol the giantess suffered damage by a sudden gust of wind that knocked down some giants. 1982 was the beginning of a new period of great activity: theater, operetta, television, music hall, advertising. They participate in gatherings and festivities inside and outside Catalonia. This year they were baptized with the names of ROC and LAIETA (Eulàlia), their godfathers being the Gegants del Pi and the singer Núria Feliu. It is also the year when the Colla de Geganters de la Plaça Nova is consolidated and with them the Grallers La Pessigolla are born. In 1985 the giants, quite damaged by their intense activity, had to be restored by master Domènec Umbert i Vilasseró. New dresses were also made according to ancient figures by Antoni de P. Rigau. They were used for the first time on the occasion of the christening of the giants of Pi, of whom they are godparents. And the following year, on the occasion of the eightieth birthday the dwarf Cu-cut is recovered. They travel to Japan in 1987 and in 1988 to Paris. After years of intense activity, in 1992, they were given on loan to the History Museum of the City. This year reproductions of the giants are crafted by Manel Casserras i Boix, and they are premiered in the procession of Corpus Christi. They are identical replicas of the old ones, in fiberglass -a meter taller-, and that recover some details details of the original ones of 1906. Since then the new giants participate in the opening ceremony of the Paralympic Games and in multiple feasts within and outside our borders. Meanwhile, the old giants, only participate in the Entourage of Sant Roc (August 16) and the procession "de les Laies" (February 12). On 15 August 1996, as part of the feast of Sant Roc de la Plaça Nova, they celebrated the ninetieth anniversary and, the old and new giants, made an exceptional "dance for four" of their usual dance: the Dance of Santa Eulàlia (eighteenth century). In 2006 their 100 years of dancing and uninterrupted feasting was celebrated. Which happened for the first time in Barcelona. In 1992, with the aim of preserving the old and valuable giants of Sant Roc de la Plaça Nova (1906), the Feast Association of Plaça Nova decided to commisssion Manuel Casserras to build identical but slightly larger giants. They were premiered in the procession of Corpus Christi of the "Seu de Barcelona" of that year. The new giants of the Plaça Nova were dressed just like the previous ones, according to Antoni de P. Rigau's design of 1955. The only differences with the old ones are that, he has a baton as when it was released in 1906, and she carries a metal headband with rhinestones, while on the old giantess the crown is made out of cardboard and is part of the sculpture. 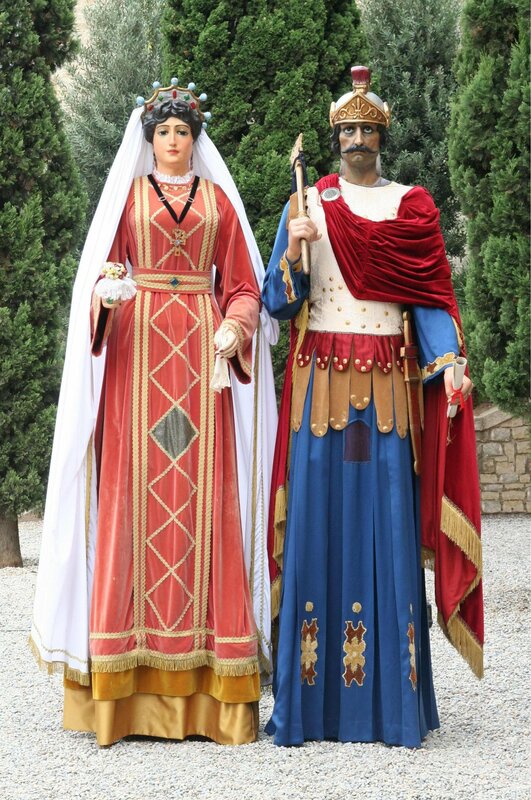 The new giants of the Plaça Nova, represent a Roman Pretor and a noble laietan lady, masters of the Roman wall of Barcelona. In 1992 they participated in the opening ceremony of the Paralympic Games, and traveled to Sicily, Narbonne, Foix, Montsegur, Perpignan, Andorra and Alcoy amongst other catalan and occitan locations. The new giants of the Plaça Nova take part in the Feast of Sant Roc, of La Mercè and of Santa Eulàlia where they do their dance: the Dance of Santa Eulàlia (Dance of the Giants of the Plaça Nova), played by the musicians: La Pessigolla. In 1996 and 2006, next to the old giants, they celebrated their ninety and one hundred years (respectively) with a unique dance between four giants. Moreover, the new giants of the Plaça Nova, in all feasts and gatherings, in and out of the city, are accompanied by the dwarf Cu-Cut.